how did you do your hair in this post? it's so amazing! Ohh, the sheer panel looks so wonderful - especially paired with your tattoo! <3 And we have the same clogs! Hooray! ooo i'm loving the shoes and the matching bow! i also love HIMYM! If you love that show you should watch Happy Endings. It's hilarious! Are those Lotta from Stockholm clogs any good?? They look great, and they're sooooo much less than the Hasbeens everybody has been wearing, but they don't have reviews on their funny little website. Your hair DOES look magical, by the way! Thank you so much. <3 The tornadoes have been near us, but thankfully not directly in our area. I have bene in love with Lotta from Stockholm shoes for quite a while now and think I might just have to get some. Your hair is always so cute!! I know I say this all the time but I love that color!! i love your hair colour its amazing so cute. i fell inspired for a change. LOVE the hair clip! Blue makes me happy and that hair clip paired with those shoes are gorgeous! I absolutely love the way your style is evolving. Swoon! oh my goodness. i would LOVE to see your tattoos! the one on your back looks amazing! and your flowery hair accessory? shut up. That shirt is so perfect! I'm so jealous ;) Have a great day! It's the skirt, I love it! Love the shoes as well! I love your Oh My Deer hairclip! The hair clip is oh so very cut on you. I love the color contrast between it and your hair. The sheer on the shirt is extra fun as well. Ohh! I love the little bit of sheer across the back of the shirt. That's too cute :) And your hair looks adorable! ah! that top is too cute. & How I Met Your Mother is one of my favs! That shirt is so, so pretty on you, Katie. And How I Met Your Mother is the besssst! how i met your mother is super ace! I love love your hair!!!!! Very cute top! My sister and I watched a few HIMYM episodes each night for a month. When we finished it on Netflix we were completely lost. I love anything sheer and/or with lace. That shirt is to die for! It's so funny that you say the sheer makes you feel more fancy, because I feel like this is one of the more casual outfits you've featured. I shy away from lace and dresses, even though I love them, because they make me feel overdressed. I think I could be quite comfortable in this outfit, though! That shirt is to die for! Your style is so inspiring! Those shoes are darling!! And I love your hair so much!! Love the pink & blue! So cute... and your hair!! I absolutely NEED to know the magical secret of your hair color! Mine looked just like yours when I was little, but now it has deepened to a darker auburn-y color, and I haven't been able to get that perfect red back that you have. Please reveal to me your secrets! Lovely! Can you do a hair tutorial for this style? 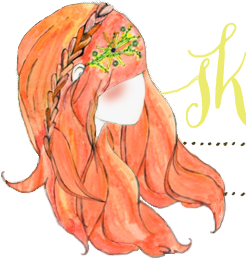 Love your hair tutorials, and would love to try this one too.... very sweet post, thanks! I cannot get over how much I love that top and your hair!